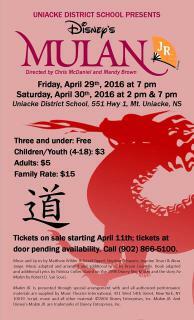 Come check out Uniacke District School's production of "Mulan Jr." April 29th-30th. Get your tickets now by calling 902-866-5100 or emailing hayb@ccrsb.ca or by calling 902-866-5100. Tickets may be available at the door depending on pre-sales. It promises to be an amazing evening showcasing Unicake District Shool's many talented students! Doors will open 30 minutes prior to show time.